In the classroom: I'll take my wins where I can get them! I'll take my wins where I can get them! I broke the class into groups of four (ordinarily I'd let them do this themselves, but I didn't know them, they didn't know me and I only had 40 minutes) and told them that the activity we were going to do was actually designed for an older class but that I was pretty sure they'd do a good job. Nothing like ramping expectations!!! I explained that one person from each group was going to come to the front of the room and study an image for 30 seconds while the other members waited silently. This first person would then return to the group and start drawing what they remembered while another person came up and looked for 30 seconds. Rinse and repeat until all four members have contributed to the drawing. At this point I gave them 30 seconds to discuss their drawing as a group and make changes if they wanted to. Then they chose one last person to come and have one last look before they made any last minute changes. Keep in mind that this whole process was silent except for the 30 seconds of small group discussion. 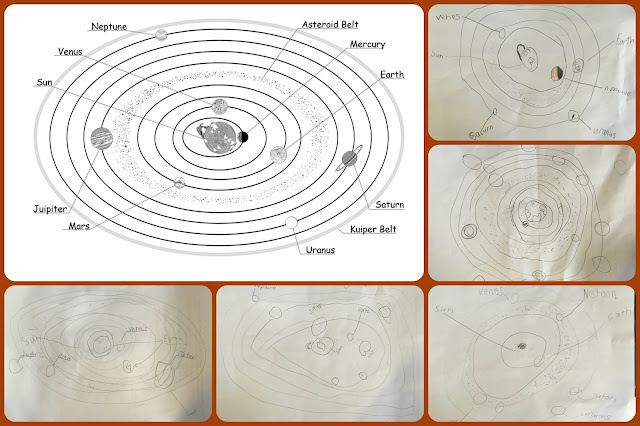 Year 1/2 Solar System Memory Team Copies by Markeeta Roe-Phillips. I paid close attention to the things on the page and tried to remember them like photos in my head. I have a book about space at home so I already knew the names so I just had to remember the shapes. 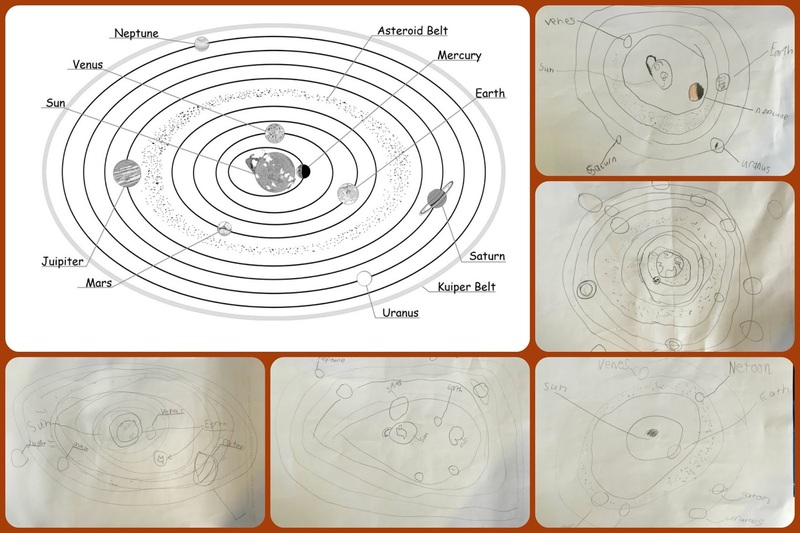 I knew we were drawing space because I was the last person so I already knew what I was looking at so I was just looking for things on the sheet that we didn't have on ours. I just tried to remember it, I don't know how I did that. So this prompted a discussion about prior knowledge. A number of children thought that using prior knowledge was cheating! I reassured them that it wasn't cheating, in fact it was something that good learners and thinkers use a lot to help them learn, understand and remember new things. Lots of darling little ooohs and aaahs! We talked a lot about memory and different strategies to help us remember things. And then I congratulated them for having a great metacognitive conversation. "A great meta-what Mrs RP?" Got 'em, hook, line and sinker! So we talked about how good thinkers and learners also think about how they think and learn, then quickly transitioned into a quick collaborative narrative building session. Oh boy. This teacher's lil' nerdy brain was doing a happy dance for quite some time afterwards. These type of recounts of your short, sharp, shiny lessons make me smile. I love hearing about student AH-HA moments - keep 'em coming. I'll try! :) Thanks for reading.